In 1921 the Nebraska State Legislature created a State Park Board within the Department of Public Works. In 1923, the law was amended by attaching the Board to the Department of Horticulture of the University of Nebraska. The Legislature of 1929 replaced the State Park Board and the Bureau of Game and Fish with a new agency, the Game, Forestation and Parks Commission. In 1967, it was designated by the Legislature as the State Game and Parks Commission. 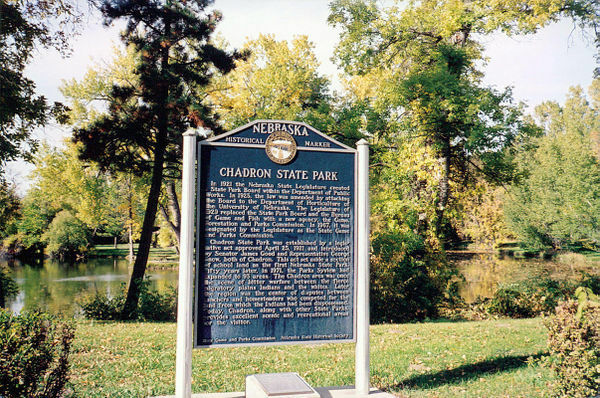 Chadron State Park was established by a legislative act approved April 25, 1921 and introduced by Senator James Good and Representative George Snow, both of Chadron. This act set aside a section of school land as the first Nebraska State Park. Fifty years later, in 1971, the Parks System had expanded to 93 areas. The Chadron area was once the scene of bitter warfare between the fierce migratory plains Indians and the whites. Later the region was the center of disputes between ranchers and homesteaders who competed for the land from which the Indians had been dispossessed. Today, Chadron, along with other State Parks, provides excellent scenic and recreational areas for the visitor. “Chadron State Park,” Explore Nebraska History, accessed April 18, 2019, https://mynehistory.com/items/show/114.